Is to achieve the correct valve opening and closing points for your engine. Cam or crank gears are incorrectly marked. Keyways are out of position on gears. Keyway in the crankshaft is miss-indexed. On SOHC rocker arm style engines, valve tip length, rocker geometry and base circle size will effect lobe separation, therefore effecting valve events. Thus properly degreeing your cam is essential. 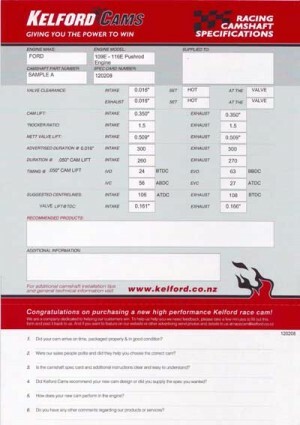 Assuming that you have carried out all of the preliminary static measurements and clearance checks for valve to valve, valve to piston, retainer to stem seal, cam to head casting, cam to con-rod, spring seat pressure, distance to coil bind at full lift etc, all parts are clean, and lightly oiled you are ready to start dialing in your camshaft. The best place to start is to install your cam on factory marks using the engine manufacturer's procedure. Be absolutely certain that you use the correct type of lifter for the camshaft that is being Degreed. Hydraulic lifters must never be used when degreeing cams, they can bleed down and give you false readings. For Pushrod style engines this is easy, if your camshaft choice is hydraulic roller or hydraulic flat tappet, simply purchase a solid equivalent of your lifter. Install a pushrod that has an oil hole in it, so that the tip of the dial indicator locates properly in the end of the pushrod. For over head cam engines that have hydraulic cam buckets, such as Nissan RB20 or Suzuki G13B or for over head cam engines with rocker arms and hydraulic lifters, such as Mitsubishi 4G63 or Nissan SR20, you will need to make a solid lifter that gives 0.1mm valve clearance when the cam is on the base circle. This is easiest done by pulling the plunger out of a hydraulic lifter and replacing it with a piece of turned silver steel (or similar) that sits properly inside the lifter body and is shaped at the valve end to clear the retainer and give a perfect flat contact to the valve tip. Attach the degree wheel to the flywheel or to the front pulley of the engine ensuring that you still have a method of manually rotating the engine. Attach the pointer to the engine ensuring that it is rigid and won't move if you accidentally bump it. Rotate the crankshaft until you get number one piston as close as possible to TDC. Next, adjust your pointer to the zero TDC position on the degree wheel. It is essential at this point that you have some means of rotating the crank that will not interfere with the degree wheel. The crank can be rotated from either the front or the flywheel end. The greater the leverage, the smoother you can rotate the crank for timing checks. (Do not use the starter for turning the engine while degreeing). Now that the Degree Wheel has been set at approximate TDC, and a means for turning the crank provided, you're ready to install and set the piston stop. Turn the crankshaft (in the normal direction of rotation) to lower the piston enough in the cylinder to move the degree wheel 15-20 degrees, screw in the piston stop until it contacts the piston, Turn the engine in the normal direction of rotation until the piston comes back up and touches the piston stop. Make a note of what degree the pointer is on the degree wheel. Turn the engine in the opposite direction until the piston comes back up and touches the piston stop again. Add these two numbers together then divide them in half. For example: Let's say that the stop points are 16° in one direction and 20° in the opposite direction. The total would be 36 degrees. This figure divided in half would be 18 degrees. Therefore 18 degrees from either of your stop points is true top dead center. Now either move the pointer to align with the 18 degree mark on the degree wheel, or carefully loosen the degree wheel (without disturbing the position of the crankshaft) and move the degree wheel to the 18 degree mark, making sure that the piston is still against the stop. Always double check measurements and readings. Repeat the procedure above until you get the same amount of degrees on both sides of TDC. Remove your piston stop and you are ready to properly degree your cam. For pushrod style engines mount the dial gauge to something solid that won't flex or move. Install a pushrod that has an oil hole in it as this will properly locate the tip of the dial indicator. It is important that the indicator plunger be aligned as closely as possible with the lifter being measured, any substantial angle between the axis of the plunger and the lifter will introduce geometrical errors into the lift readings. With the cam on the base circle set the dial gauge to zero with enough preload that the gauge is held firmly but not so much preload that you bind the gauge on full lift. the lifter could be sticking slightly in its bore. Find the trouble and correct it before proceeding. 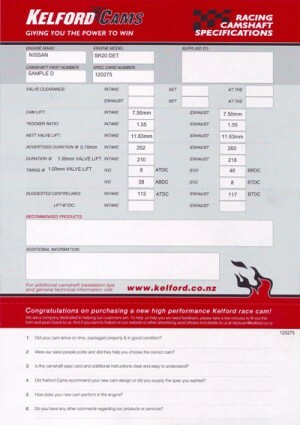 All the information you need for checking valve timing of your engine is provided on the specification card that you receive with your new Kelford cam. This will include the opening and closing timing points and the amount of lift at the lifter or at the valve (depending on engine type) at which the timing should be checked. It will include Cam lift, rocker ratio, Net valve lift, valve lash (tappet clearance) and more. The method we use below is the correct method to accurately degree your cam to achieve the proper valve opening and closing events. We have split the method into two engine types to give proper examples. Pushrod engines and Over head cam engines. Using the intake opening and closing at .050" cam lift, obtained from the information on your cam spec card, turn the engine in the normal direction of rotation. Watch the dial indicator. When it moves up .050", stop rotating the engine. Record the degree wheel number that the pointer is on. (In our example spec card ‘A' it is 24° BTDC). Continue to rotate the engine in the same direction. Watch the dial indicator; it will change direction at maximum lobe lift. Record the cam lobe lift, this should match the cam lift figure on your spec card (.350" in the example of Spec card ‘A'). Continue down to zero lift and verify that the dial indicator has returned to zero. The opening and closing figures should be within ±1 degree. At this point we check the duration and centerline by adding the Intake Opening (IO) point before TDC plus 180 degrees of crank rotation to get us to BDC plus the Intake Closing (IC) point in degrees ABDC so using the figures on spec card ‘A' we calculate as follows, 24+180+56 = 260 degrees of intake duration at .050" cam lift. This figure should match the duration figure on your spec card, 260 degrees divided by two less the intake opening gives you the centerline number that should match your spec card e.g. ; 260/2-24=106degrees ATDC. If the camshaft has a short duration and / or late valve events like the one in the example spec card ‘B", the Intake Opening point could be ATDC in which case the equation to find duration is: 180 degrees from TDC to BDC, less the Intake Opening point in degrees ATDC plus the Intake Closing point in degrees ABDC. For example ‘B' Inlet Opens 5 degrees ATDC, Inlet Closes 45 degrees ABDC the equation is 180-5+45=220 degrees of cam duration at .050" cam lift. To find the centerline figure the equation is: Duration divided by two, plus the Inlet Opening point example ‘B' would then be: 220/2+5= 115 degrees ATDC centerline. If the duration matches but the centerline figure and open and close events do not, you will need to advance or retard the cam to achieve the correct result. Go through the procedure again until you are within one degree of where you want to be (preferably on the advanced side if anything to allow for chain / belt stretch during operation). Depending on the engine being used, there are usually offset bushings, offset keys, or multi-indexed gears to accomplish this movement. Once you are happy, move to the exhaust and repeat the process. Using spec card A we have an Exhaust Opening (EO) of 63 degrees BBDC and an Exhaust Closing (EC) of 27 degrees ATDC, the equation is 63+27+180 = 270 degrees of exhaust duration at .050" cam lift, to find the centerline as a double check, the formula is duration divided by two less exhaust opening; 270/2-27 = 108 degrees BTDC. If your intake is set correctly the exhaust should match the spec card as well unless there is a variation in the separation. To find separation, simply add the intake and exhaust centerline and divide by two. As a triple check, measure the valve lift at TDC, and this should also match the card. For mechanical lifter over head camshafts all readings are taken with the valve lash set to the proper clearance as specified by the cam card. For hydraulic lifter over head camshafts, use a mechanical lifter for checking and set clearance to zero (remember to replace the checking lifter with the proper lifter once all checking is complete). Turn the engine in the direction of rotation until you reach 1.00mm valve lift on the dial indicator, record the figure on the degree wheel, continue to rotate in proper direction counting up to full valve lift. Record the full valve lift figure; this should match the figure on your spec card. Continue to rotate in proper direction, counting down from full lift until you are 1.00mm away from fully closed, record the degree wheel figure. As an example spec card ‘C' gives an Intake Valve Opening (IVO) of 4 degrees BTDC and Intake Valve Closing (IVC) of 46 degrees ABDC. To find duration, the formula is IVO of 4 degrees BTDC plus 180 degrees to get to BDC plus 46 degrees to the IVC point ABDC; 4+180+46 = 230 degrees of duration at the valve at 1.00mm checking height. Use this formula to check that your measured duration matches your spec card. The formula to find the centerline of the intake in example ‘C' is, duration divided by two less IVO; 230/2-4 = 111 degrees ATDC, this should match the figure on your spec card, if it doesn't you will need to advance or retard the cam and repeat the procedure until it is correct. Once you are happy, move to the exhaust and repeat the process. Using spec card C we have an Exhaust Valve Opening (EVO) of 38 degrees BBDC and an Exhaust Valve Closing (EVC) of 2 degrees BTDC, the equation is 38+180-2 = 216 degrees of exhaust duration at 1.00mm valve lift. To find the centerline as a double check, the formula is duration divided by two plus exhaust closing; 216/2+2 = 110 degrees BTDC. If the camshaft has a short duration and / or late valve events like the one in the example spec card ‘D", the Intake Opening point could be ATDC in which case the equation to find duration is: 180 degrees (from TDC to BDC), less the Intake Opening point in degrees ATDC plus the Intake Closing point in degrees ABDC. For example ‘D' Inlet Opens 8 degrees ATDC, Inlet Closes 38 degrees ABDC the equation is 180-8+38=210 degrees of duration at 1.00mm valve lift. To find the centerline figure the equation is: Duration divided by two, plus the Inlet Opening point example ‘D' would then be: 210/2+8= 113 ATDC centerline. Once you are satisfied that the intake is correct move to the exhaust and repeat the process. Using spec card D we have an Exhaust Opening (EO) of 46 degrees BBDC and an Exhaust Closing (EC) of 8 degrees BTDC, the equation is 180-8+46 = 218 degrees of exhaust duration at 1.00mm valve lift, to find the centerline as a double check, the formula is duration divided by two plus exhaust opening; 218/2+8 = 117 degrees BTDC. Overlap at 1.00mm valve lift from Spec card ‘C' = IVO of 4 degrees BTDC less 2 degrees BTDC = 2 degrees at 1.00mm valve lift. To find total overlap, check valve timing at 0.1mm valve lift as a checking height, if the valve motion is symmetrical at that lift, our example spec card cam which has a intake duration of 270 degrees and an exhaust duration of 256 degrees at 0.1mm will have valve timing events of IVO 24 BTDC / IVC 66 ABDC - EVO58 BBDC / EVC 18 ATDC giving an overlap of 24+18= 42 degrees. Because of camshaft ramp designs the valve events at a lift as low as 0.1mm are often asymmetrical this is why we specify checking valve timing at 1.00mm or .050" (in the case of imperial engines), it is more accurate for most people. Never use the ‘centerline' method that zeros somewhere near full lift and then splits the difference between two readings on the degree wheel either side etc, this is not accurate. The full lift position is not relevant to the engine it is only a quick reference figure used in dialogue amongst engine builders. Incoming intake charge or outgoing exhaust does not care where the centerline is, they only respond to filling or evacuating the cylinder based on relevant valve opening and closing events. It is not accurate to use the centerline number to determine valve events. It is accurate to use the valve event figures to determine a centerline number. The problem with the centerline method is it has you finding the theoretical point of peak lift in relation to crank rotation. This method makes the assumption that the lobe or valve motion you are checking is symmetrical; with its opening side being the exact same shape as the closing side of the lobe. Most modern cam lobes are asymmetrical, with the opening side of the lobe being much more aggressive and the closing side being gentler. Therefore when you attempt to locate the middle (or centerline) of the asymmetrical lobe there is an automatic error. It could be as little as 2° or as much as 6° depending on the actual lobe design. Also, the centerline method does not really indicate if your camshaft was properly produced, as no confirmation of the duration at any given point. Our method will verify correct valve opening and closing and duration. Looking for a more in-depth course on How to Degree a Cam? The High Performance Academy has a courses that covers this specific topic in a huge amount of detail. In the HPA “How to Degree a Cam” course you will learn a 6 step process to easily dial in any cam and any engine. The lessons are delivered via high quality, online video. To get 50% OFF use the coupon “GH1XHR“ at checkout, making the course just $24.50USD. Start learning now, get instant access to the “How to Degree a Cam” course now.